Well, sold the GT-150 and it started it's long journey yesterday to England. Sad to see it leave, but realities of loosing storage (for now) and shift in priorities, had to make an adjustment. I believe Grant has posted on here several times, so we'll probably see it again across the pond sometime soon. Would like to focus on a few of the CVX20 needs. I was wondering if we have a source for the rubber strip that goes under the CVX windshields? Or something close to original? Originally, my boat was bought without a windshield. A previous owner installed one, but set at wrong angle (IMO) and it had nothing between hull and windshield. When I drilled some new holes and reset it where I thought it should be, I used some basic foam strips, but they have moved over time and I don't like the way it looks. So, it would be great to use something like the original rubber that had a raised edge (see pic) on it... very nice finished look. '76 Glastron/Carlson CVX-20 Jet, 455 Olds--"Julius"
'62 Glastron 153 Surflite Hardtop, '63 Evinrude 40hp Lark III--"Gator 62"
There is a product, comes in colors, that is used between fenders and body on old air cooled VW beetles. Known as fending beading or welting, its available fairly inexpensive from many sources. A bit of adhesive to the windshield and it will never move once bolted/screw through to body. When you guy's find something that works .. Please let me know and I'll post to the "Glastron / Carlson windshield" thread. Here is a pic, pretty certain I have a bunch laying around, shoot me a message and I could mail a sample. Plenty of colors as well. I don't sell it, but I also restore vw's. Don't buy any pre cut for VW installation, you'll want a full tab. Thanks Mike, that would be great if you could mail a sample. I'll shoot you a PM. Mark, I don't remember where I got this pic from. 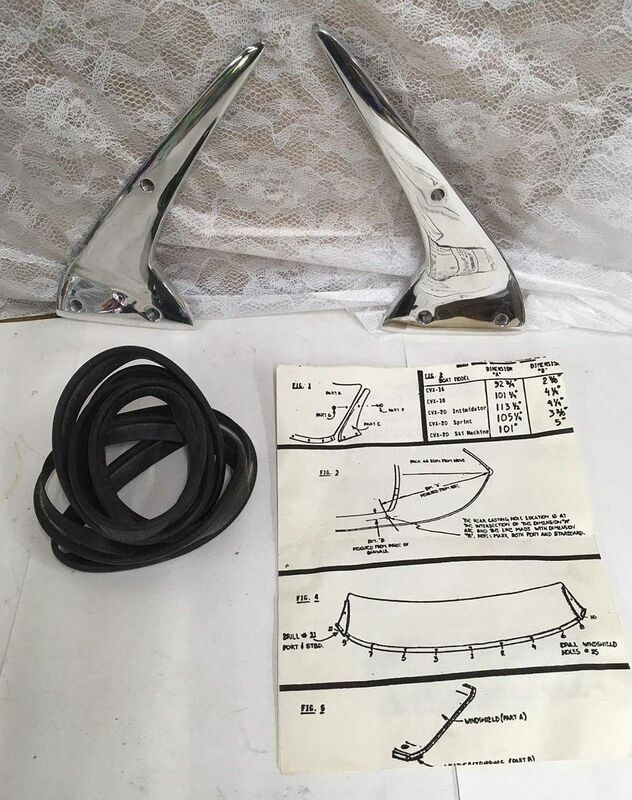 It must have been someone selling the windshield trim pieces, however the included windshield placement details may help your cause. John .. Do you have a higher resolution of that picture ? When I blow it up, it gets to grainy to read ..
Can you enlarge the whole thing, or just section by section ? 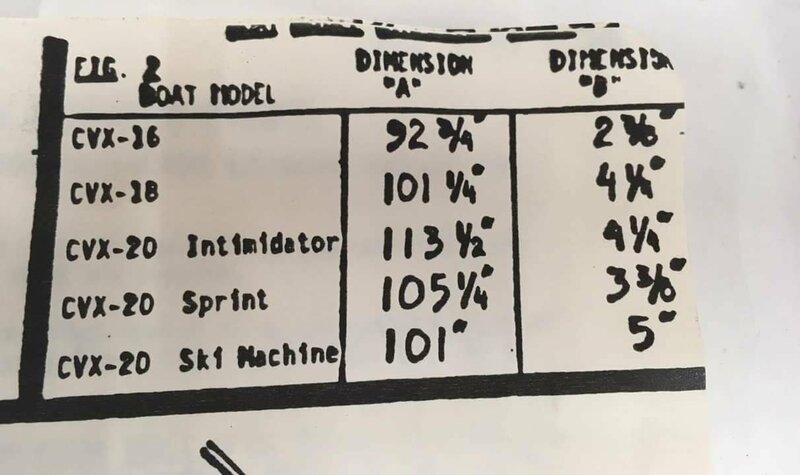 Interesting John, I think I can see what they are doing... measurement A from bow, B from side, wonder what measurement I would use for my CVX20, as it's not an intimidator, Sprint, or Ski Machine. Regardless, will be interesting to check the numbers from what I have done and what the previous owner did to these numbers, see how close or how far I ended up from where it should be. I think the welting Mike mentioned will probably work for seal, even if I have to trim it down and make it not so wide. I'll need to get a sample and see.